With a new year, the Freer|Sackler launches a new initiative: Open F|S. We’ve digitized our entire collection and today, we’re making it available to the public. That’s thousands of works now ready for you to download, modify, and share for noncommercial purposes. 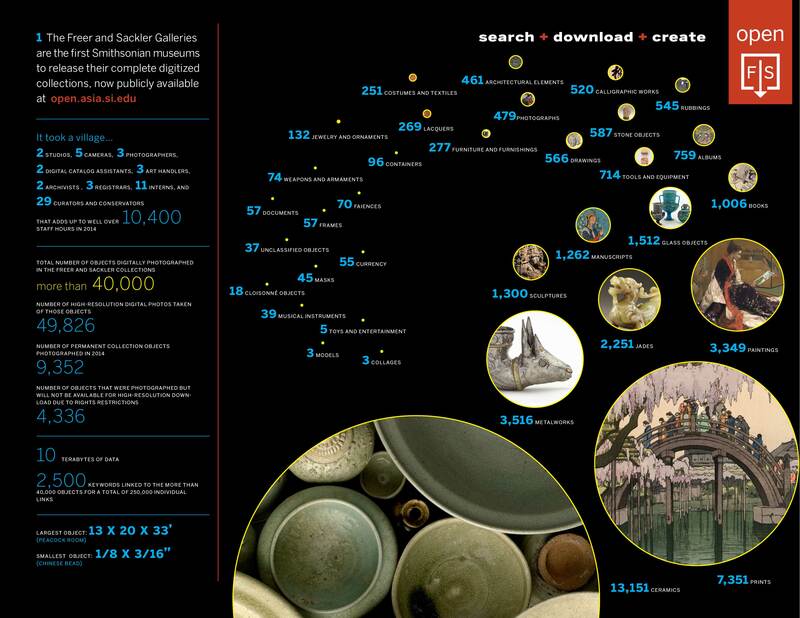 As Freer|Sackler Director Julian Raby said, “We strive to promote the love and study of Asian art, and the best way we can do so is to free our unmatched resources for inspiration, appreciation, academic study, and artistic creation.” More facts and figures about the project can be found in the infographic below. Tomorrow, we’ll also introduce the Friday Fave, a weekly blog series in which Freer|Sackler insiders will describe their favorite objects in the newly digitized collections. It’s a chance for us to share with you what inspires us, in the hopes that in the coming months, you’ll tell us your own stories about cherished F|S objects. To participate further, sign up to be a beta tester and help us ensure the ongoing success of Open F|S as it expands and evolves. Happy New Year, and Happy Open F|S! Next Post Next Post: Friday Fave: Tigers!